Now that we can officially call it SPRING, I wanted to share an old favorite of mine. It’s no surprise I love color so why not welcome in spring with bright pink and yellow hues? This luncheon tablescape is full of inspiration for bridal showers, baby showers, birthday parties, and lots of different celebrations. Read through my tips and details below to recreate the look. 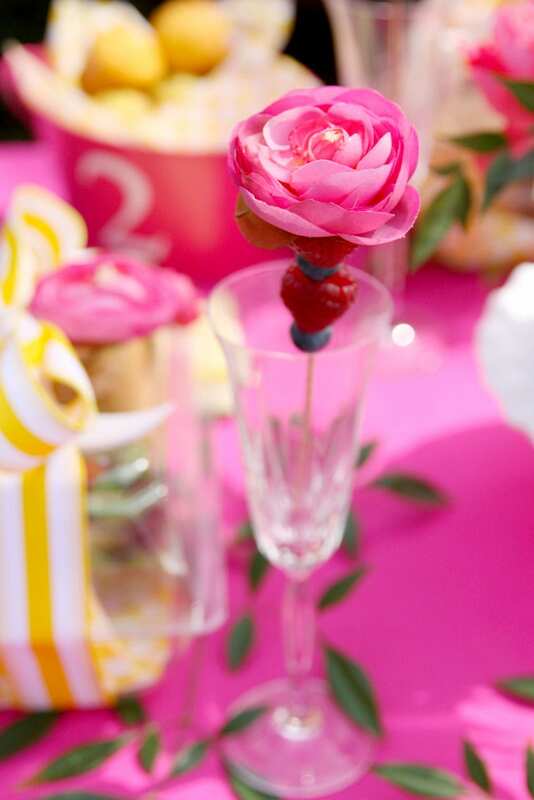 So usher in spring with blooms, a spring lunch, and lots of pink! While I was recently browsing the aisles of a craft store, I came across corsage boxes in the wedding aisle. They were just simple plastic containers that closed at the top. Hello! Cute lunch boxes for outdoor parties! 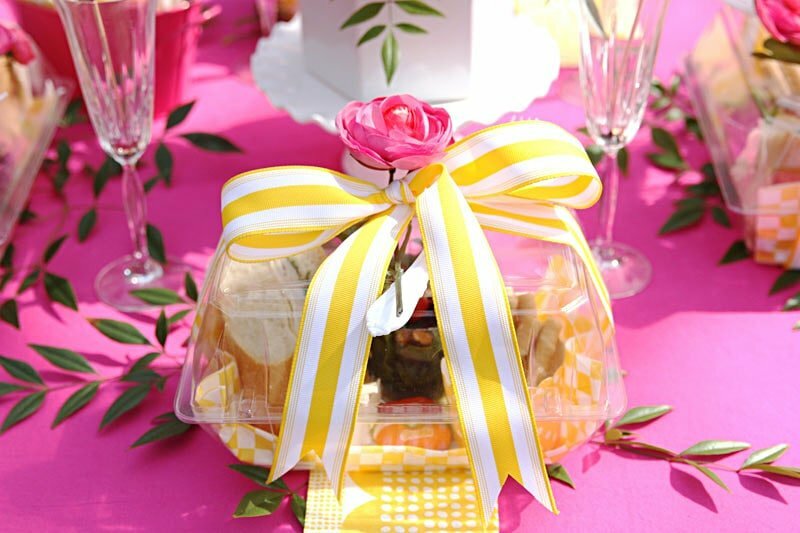 If you’re worried about using breakable plates and china outside and are looking for an alternative to paper plates, these corsage boxes are fabulous when repurposed for lunch containers. I jazzed them up in a few steps! Line plastic corsage boxes with fun parchment paper liners. I chose a yellow + white check. 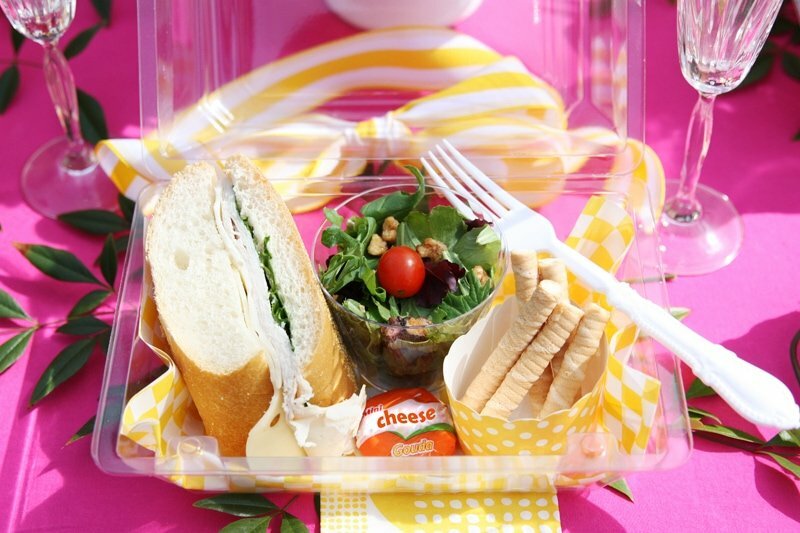 Fill with a delicious lunch! 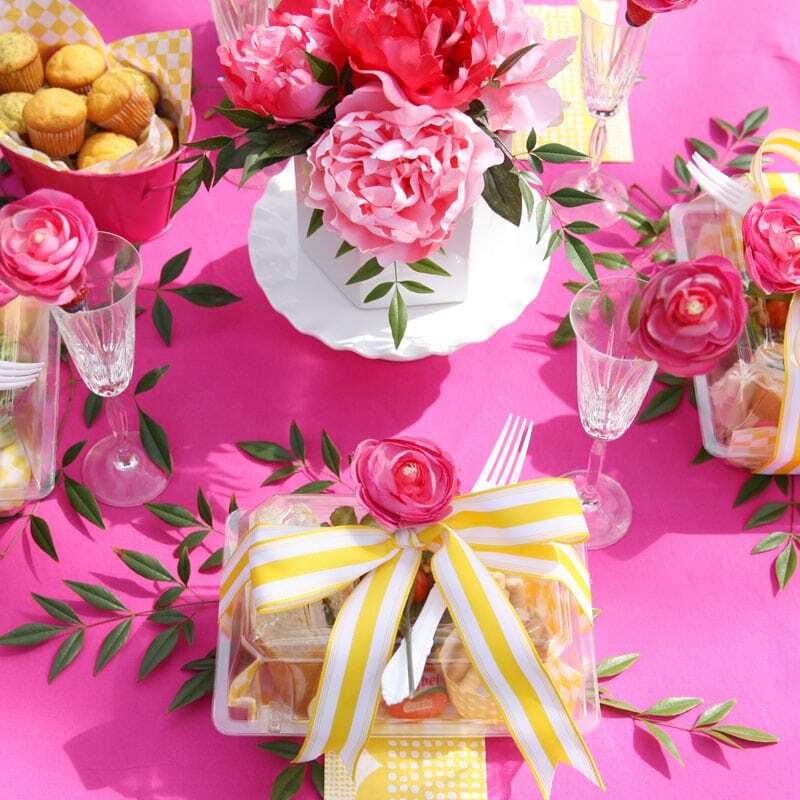 Serve salads in clear plastic cups and cookies in cupcake liners. 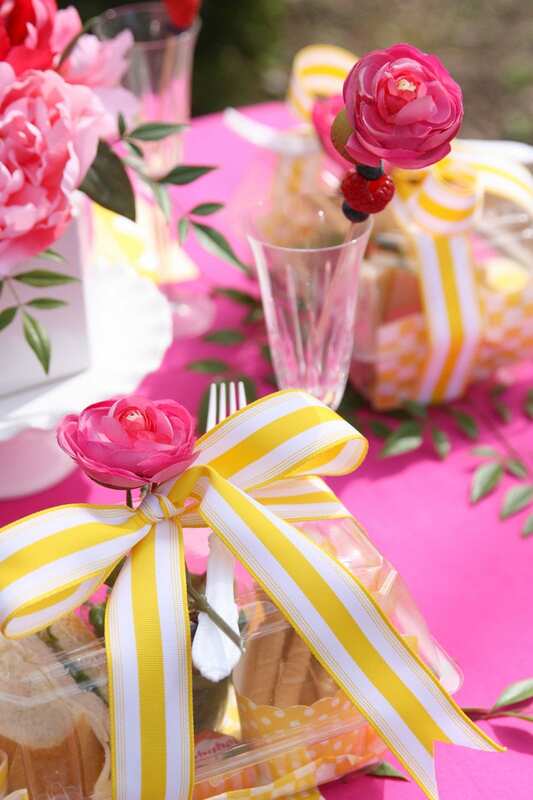 Close box and tie with a yellow and white striped ribbon, flower detail, and simple white fork! When looking for a tablecloth, skip the vinyl as it never looks fully smooth. Visit your fabric store and grab some simple cotton, iron, and it’s ready to go! I chose a hot pink to usher in the cheery, spring season! The fabric is easily washable and reusable for parties to come. 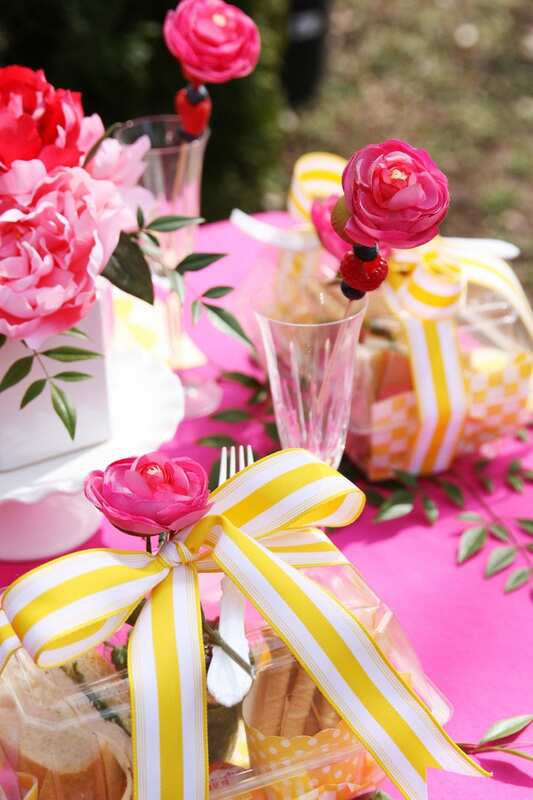 Keep your color scheme simple-two colors (pink and yellow) with touches of white. 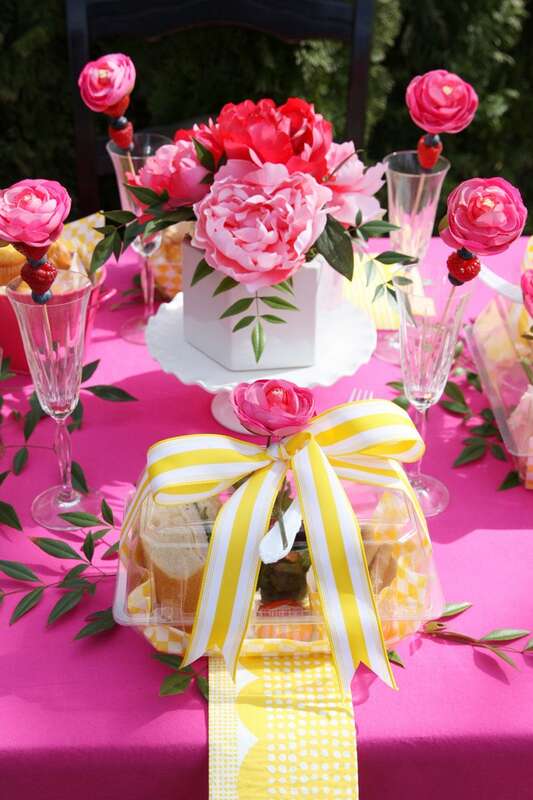 A simple cake stand topped with a vase of pink peonies makes an easy centerpiece. Use extra greenery under the corsage boxes. Spring is all about the flowers so don’t be afraid to let them shine! My favorite detail from the party was the drink stirrers! Top a bamboo skewer with a silk flower (use hot glue to keep in place if necessary). Slide on berries for a delicious twist to your drink of choice! 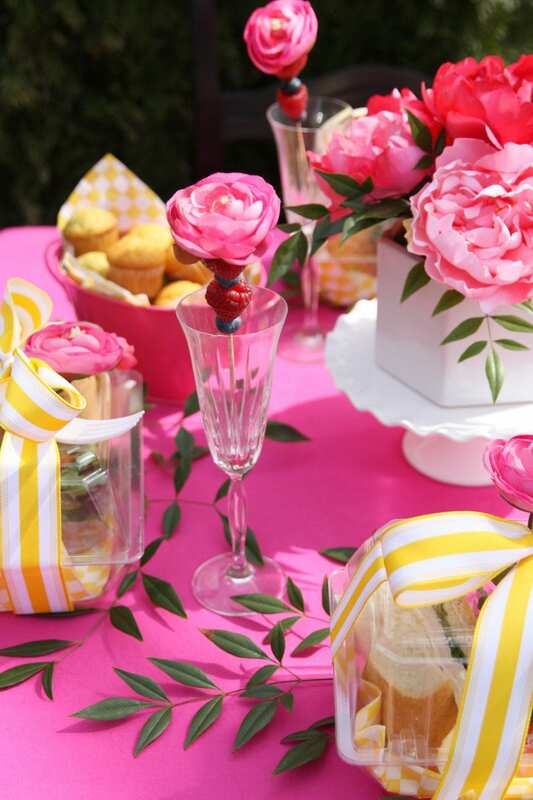 Pick and choose from these simple party ideas to create a gorgeous and colorful spring party or recreate the look for your own celebration! LOVE the drink stirrers! Thanks for the great ideas! These colors are PERF. On point. Amazing. Love the corsage boxes. Haven’t seen that before.